Varicose veins, also known as varicose or varicosities occur when your veins become enlarged, dilated, and overfilled with blood. Varicose veins typically appear swollen and raised, and have a bluish-purple or red color. They are often painful. The condition is very common, especially in women. Around 25 percent of all adults have varicose veins. In most cases, varicose veins appear on the lower legs. There are various options, including some home remedies. 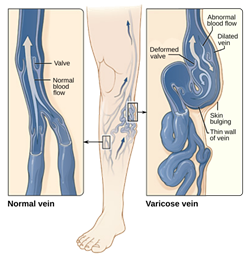 In severe cases, a varicose vein may rupture, or develop into varicose ulcers on the skin. These will require treatment. →Pregnant women are more susceptible to varicose veins. →Symptoms can include aching legs, swollen ankles, and spider veins. →People who are overweight have an increased risk of varicose veins. Arteries carry blood from your heart to the rest of your tissues.Veins return blood from the rest of your body to your heart, so the blood can be recirculated. To return blood to your heart, the veins in your legs must work against gravity. Muscle contractions in your lower legs act as pumps, and elastic vein walls help blood return to your heart. Tiny valves in your veins open as blood flows toward your heart then close to stop blood from flowing backward. →Appear blue because they contain deoxygenated blood, which is in the process of being recirculated through the lungs. Some pregnant women develop varicose veins. Pregnancy increases the volume of blood in your body, but decreases the flow of blood from your legs to your pelvis. This circulatory change is designed to support the growing fetus, but it can produce an unfortunate side effect enlarged veins in your legs. Varicose veins may surface for the first time or may worsen during late pregnancy, when your uterus exerts greater pressure on the veins in your legs. Changes in your hormones during pregnancy also may play a role. Varicose veins that develop during pregnancy generally improve without medical treatment three to 12 months after delivery. 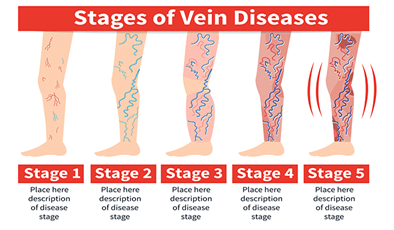 → Color changes, hardening of the vein, inflammation of the skin or skin ulcers near your ankle, which can mean you have a serious form of vascular disease that requires medical attention Spider veins are similar to varicose veins, but they’re smaller. Spider veins are found closer to the skin’s surface and are often red or blue. They occur on the legs, but can also be found on the face. Spider veins vary in size and often look like a spider’s web. →The risk of varicose veins increases with age. Aging causes wear and tear on the valves in your veins that help regulate blood flow. Eventually, that wear causes the valves to allow some blood to flow back into your veins where it collects instead of flowing up to your heart. →Women are more likely to develop the condition. Hormonal changes during pregnancy, premenstruation or menopause may be a factor because female hormones tend to relax vein walls. Taking hormone replacement therapy or birth control pills may increase your risk of varicose veins. → If other family members had varicose veins, there a greater chance you will too. → Being overweight puts added pressure on your veins. → Standing or sitting for long periods of time, your blood doesn’t flow as well if you&#39;re in the same position for long periods. The most common diagnostic investigation performed on patients with varicose veins is an ultrasound venous Doppler test. This is similar to the ultrasound used to perform abdominal and pregnancy scans. A venous Doppler test gives an anatomical and functional view of the veins of the leg. The test relies on the skill of the operator to be successful and can reveal information about the damaged and normal veins, the size of the veins, together with the site of the damaged perforator veins which connect the deep veins to the superficial veins. At Varicose Veins clinic, all venous Doppler scans are performed by our varicose veins specialist and the findings documented. Depending upon whether the patient is symptomatic (S) or asymptomatic (A) e.g. C2S. → Self-care: Self-care such as exercising, losing weight, not wearing tight clothes, elevating your legs, and avoiding long periods of standing or sitting can ease pain and prevent varicose veins from getting worse. → Compression stockings: Wearing compression stockings all day is often the first approach to try before moving on to other treatments. They steadily squeeze your legs, helping veins and leg muscles move blood more efficiently. The amount of compression varies by type and brand. → Sclerotherapy: In this procedure, your doctor injects small- and medium-sized varicose veins with a solution that scars and closes those veins. 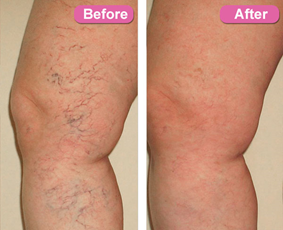 In a few weeks, treated varicose veins should fade. Although the same vein may need to be injected more than once; sclerotherapy is effective if done correctly. Sclerotherapy doesn’t require anesthesia and can be done in your doctors office. → Foam sclerotherapy of large veins: Injection of a large vein with a foam solution is also a possible treatment to close a vein and seal it. This is a newer technique. → Laser surgeries: Doctors are using new technology in laser treatments to close off smaller varicose veins and spider veins. Laser surgery works by sending strong bursts of light onto the vein, which makes the vein slowly fade and disappear. No incisions or needles are used. → Catheter-assisted procedures using radiofrequency or laser energy: In one of these treatments, your doctor inserts a thin tube (catheter) into an enlarged vein and heats the tip of the catheter using either radiofrequency or laser energy. As the catheter is pulled out, the heat destroys the vein by causing it to collapse and seal shut. This procedure is the preferred treatment for larger varicose veins. → High ligation and vein stripping: This procedure involves tying off a vein before it joins a deep vein and removing the vein through small incisions. This is an outpatient procedure for most people. Removing the vein won&#39;t adversely affect circulation in your leg because veins deeper in the leg take care of the larger volumes of blood. → Ambulatory phlebotomy: Your doctor removes smaller varicose veins through a series of tiny skin punctures. Only the parts of your leg that are being pricked are numbed in this outpatient procedure. Scarring is generally minimal. → Endoscopic vein surgery: You might need this operation only in an advanced case involving leg ulcers if other techniques fail. Your surgeon uses a thin video camera inserted in your leg to visualize and close varicose veins and then removes the veins through small incisions. This procedure is performed on an outpatient basis. Following your treatment for varicose veins, you’ll have regular visits with your vascular specialist. We’ll ensure your treatment was effective and that you are no longer experiencing symptoms.